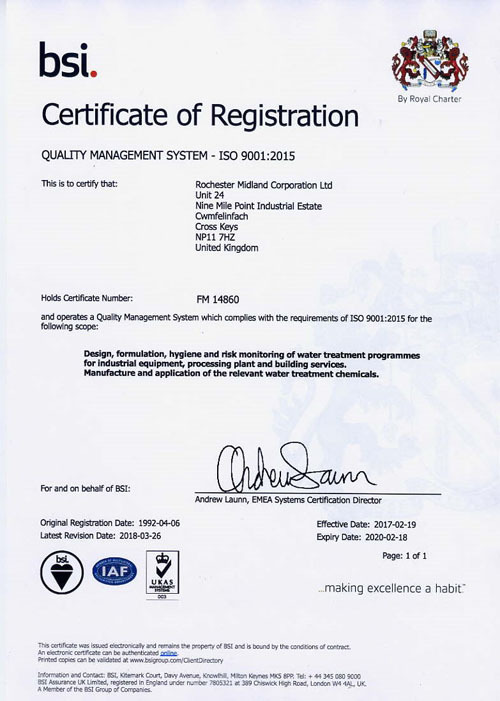 Following an annual Quality Audit by BSI inspectors during March 2018, Rochester Midland is proud to announce it has recently achieved and upgrade in its quality standard from ISO 9001:2008 to ISO 9001:2015 with no non-conformities identified. The company has been a firm believer in quality since it opened its doors in 1996 and has regular audits from BSi to check it’s procedures and policies are up to scratch. After working on the new standard for over a year and re-writing the existing quality manual, we were delighted to get the news from the auditor that all was approved to the high standards laid out by BSi. Rochester Midland Business Director Wayne Hopkins pays tribute to the Senior Management Team and staff and, in particular, to Operations Manager Stephen Biggs. “Stephen’s drive and commitment not only during the BSI audit but in the run up to it were outstanding. Stephen and the team deserve the highest praise”. For their records, clients can request a copy by emailing hq@rmcorp.co.uk or contacting your Rochester Midland Representative.